Free Hot Water conducts a free on-site assessment. We determine shading and available sunlight during different times of the day and estimate your yearly solar system potential. Next, we measure the available roof or ground area. Using your past utility and water bills that we obtain from your utility company, we determine the ideal solar thermal system to optimize your investment. Using the site and energy use analysis, as well as your budget, our Free Hot Water engineers design a system to fit your application. We then present a bid for the system cost, clearly outlining the scope of work and project timeline. Free Hot Water bids include all system materials (and a 10 year warranty on all parts), installation, rebate and incentive applications and any required permits. One of our certified Free Hot Water installers will then contact you to arrange installation. We submit your rebate application(s) and any required building permit applications, including all necessary blueprints and designs. One of our certified Free Hot Water contractors installs your system in a timely fashion and arranges any required inspections. After inspections are approved, your solar thermal solution is now operational begins to pay for itself with immediate energy savings. 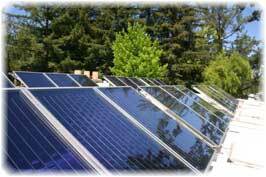 Or contact us for a free solar hot water evaluation for your commercial application.